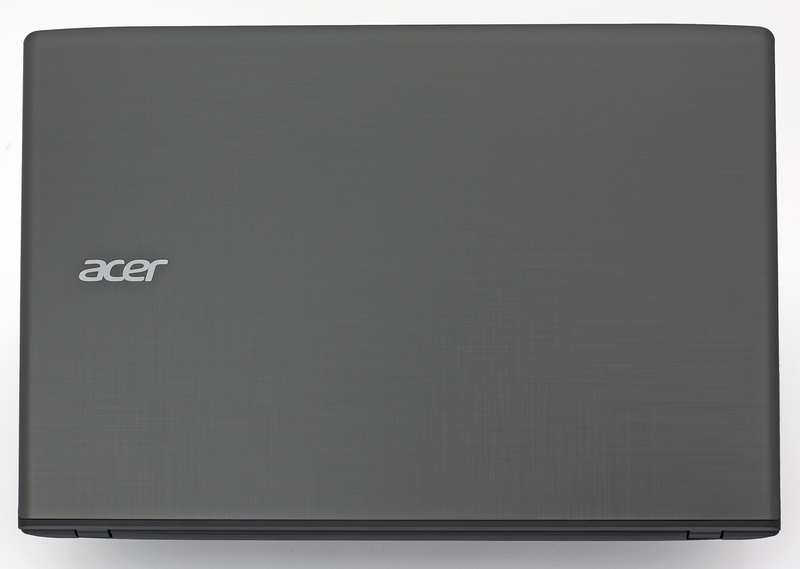 Acer has always been the one OEM on the market pursuing sales by aggressive pricing. Most of their mainstream notebooks are priced considerably lower than its direct competitors while offering similar if not more powerful hardware. The newly released Aspire E15 (E5-575G) notebook makes a compelling case with a good performance/price ratio and successfully rivaling the similarly priced ASUS X556 notebook, which comes with the same 940MX GPU with GDDR5 VRAM and a lackluster screen to compensate for the lower price. However, the E5-575G comes in strong with probably better screen quality and identical hardware. What’s more is that Acer’s solution somehow offers a much better build quality and input devices. 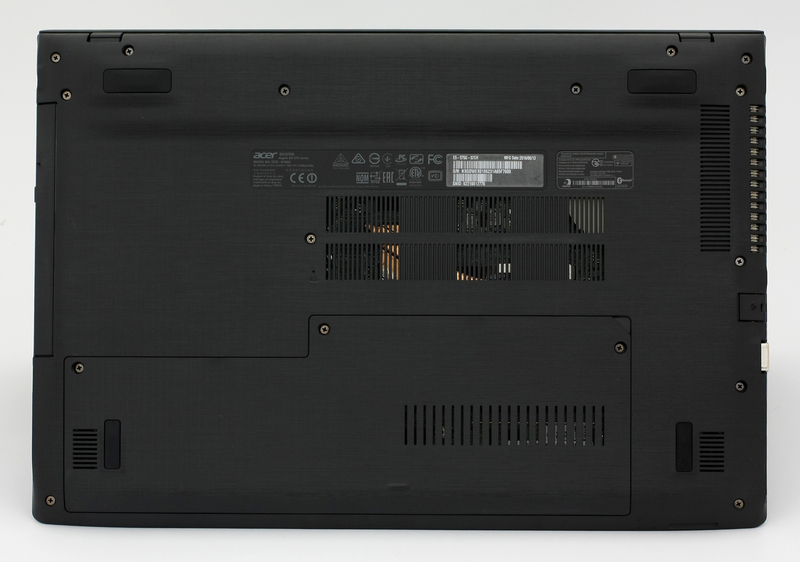 The successfully adapted design from the Aspire E5-573 makes an appearance here as well with a bit more refined details like the outer surface and interior. It’s definitely an excellent all-rounder with an absurdly low asking price but does it make any major compromises the specs sheet doesn’t tell you about? That’s why we are here. 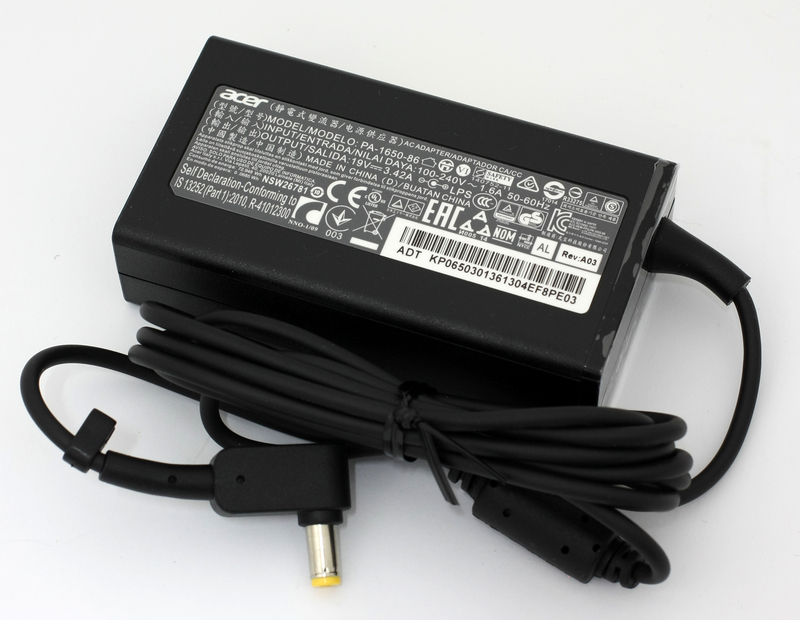 There’s nothing in the box that you won’t usually find – AC adapter, power cord, DVD with drivers and, of course, user manuals. The whole design concept is borrowed by the mid-range Aspire V3 series minus the patterned aluminum lid. It’s mostly plastic with silky smooth surface and a denim-like pattern we saw on the entry-level E5-573. In fact, the chassis weighs just as much – 2.39 kg but it’s not as slim as the aforementioned models. As we already said, plastic is the main material used for the build including the lid. It features a slightly flexible panel with patterned and smooth finish resembling denim. Despite the bendable material, pushing the backside of the lid doesn’t cause major distortions on the LCD screen. 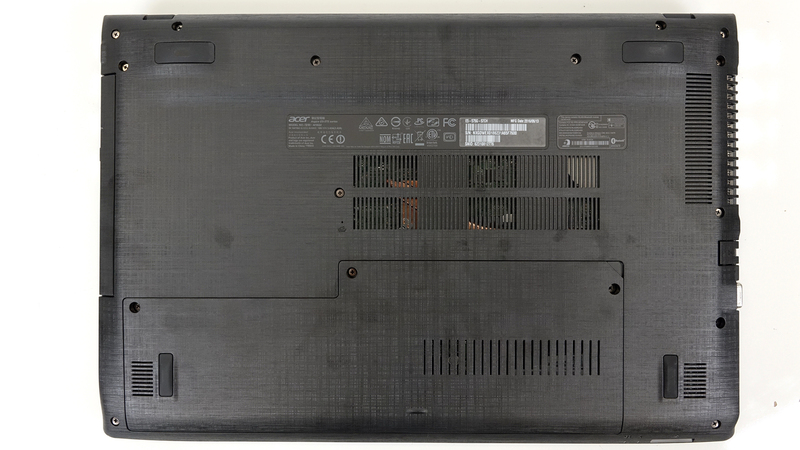 The hinges appear to be stable but are also a bit overly tightened at the beginning of the travel making it impossible to open the laptop with one hand. 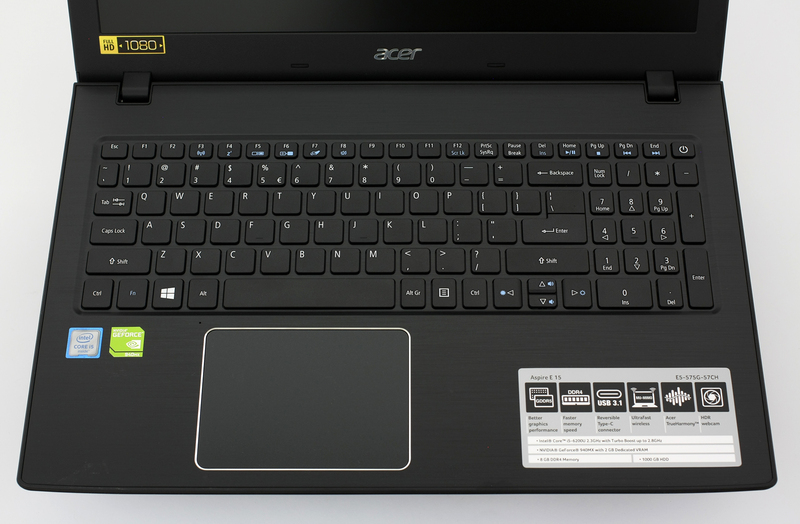 And finally, Acer decided to include a service lid on its notebook so you can easily upgrade RAM and storage without the need of detaching the whole bottom. As for the sides, they seem to be a bit overcrowded but deliver the usual set of ports including the VGA connector, by which we are still baffled. Who still uses that, seriously? So the left side accommodates the aforementioned VGA along with the HDMI, two USB 3.0 ports, LAN and a USB-C connector. 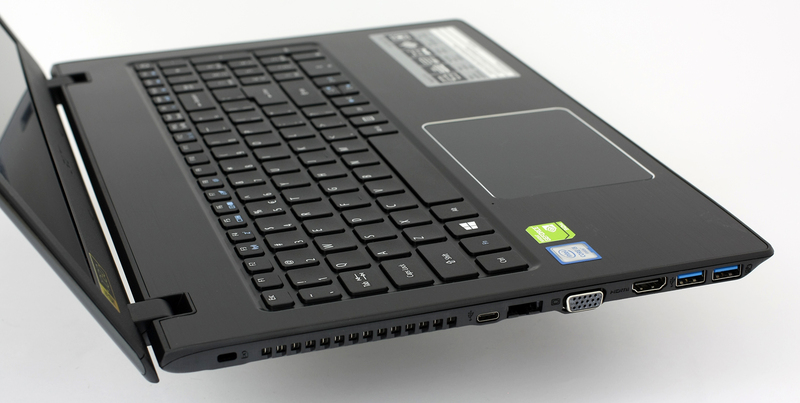 That’s the cheapest notebook with a USB Type-C USB we’ve reviewed so far, so kudos for that. The left side is also where the main exhaust vent resides so the hot air won’t blow directly to your right hand when the GPU is loaded. And the right side, it has only one 3.5 mm audio jack, USB 2.0 and an optical drive. The DC charging port is also on the right. We are satisfied with the healthy port placement the E5-575G provides. The interior is where this notebook shines. A brushed aluminum surface covers the area around the touchpad and keyboard with the former being surrounded by chamfered edges. The surface is identical to the one on the Aspire S 13 and the Aspire F5-572G offering the much-needed stability when typing and the keyboard sinks in only under heavy pressure, which won’t affect the user’s experience in practice. Our only problem with it is being too prone to smudges and fingerprints. It requires frequent cleaning. However, the excellent touchpad integration and keyboard make up for it. The touchpad isn’t wobbly, it’s accurate and large enough for comfortable use. The keyboard is also pretty decent but feels a bit shallower than the E5-573’s despite the shared design with curved and island type keys. Starting at just $549, the Acer Aspire E5-575G delivers more than you’d expect in the design department. Yes, it might not be the lightest or thinnest machine out there, but it’s on par with its competitors in terms of mobility and provides excellent stability and rigidity. We can easily say it comes on top of some other similarly priced alternatives like the ASUS X556, for example. 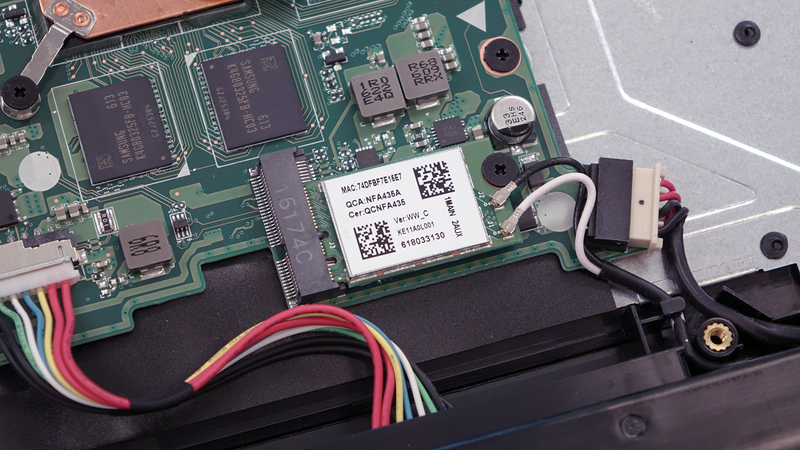 Luckily, the notebook provides easy access to the M.2 SSD slot, the two RAM slots and the 2.5-inch HDD via a big maintenance hatch. 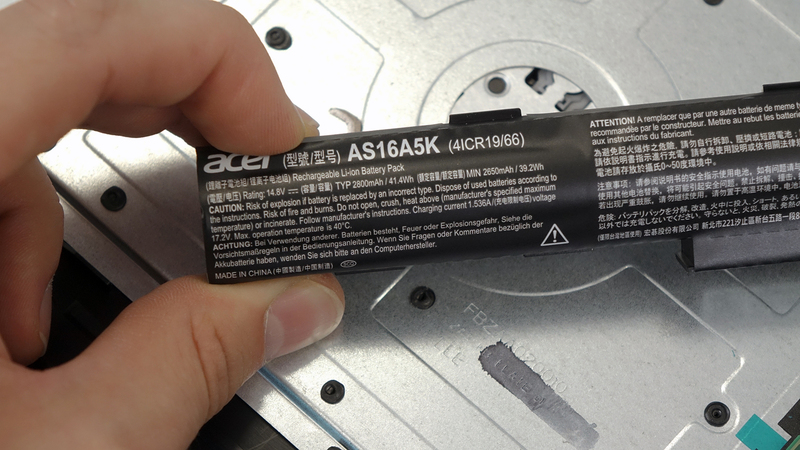 But to access the battery, for example, you will need to perform almost full disassembly. 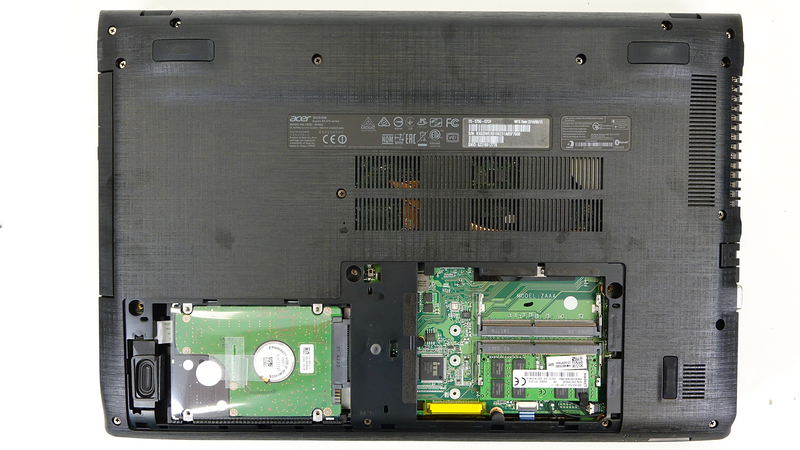 As we already mentioned, the laptop comes with a 2.5-inch HDD manufactured by Seagate with 1TB capacity. The M.2 slot is free to upgrade. We tried to run an M.2 SATA 2280 SSD stick and it worked perfectly without the need of changing any BIOS settings. The motherboard uses two RAM slots one of which is taken by a an 8GB Kingston DDR4-2133 chip. To access the battery and Wi-Fi card, you need to remove the whole bottom cover. Unscrew all the bolts and then remove the optical drive. Then the bottom piece pops out easily. The Wi-Fi module is Qualcomm QCNFA435. The battery is rated at 41.4Wh (2800 mAh). The cooling system did relatively fine but due to its placement, it caused some parts of the interior to heat up a little bit. You can read more about it in the temperature section. 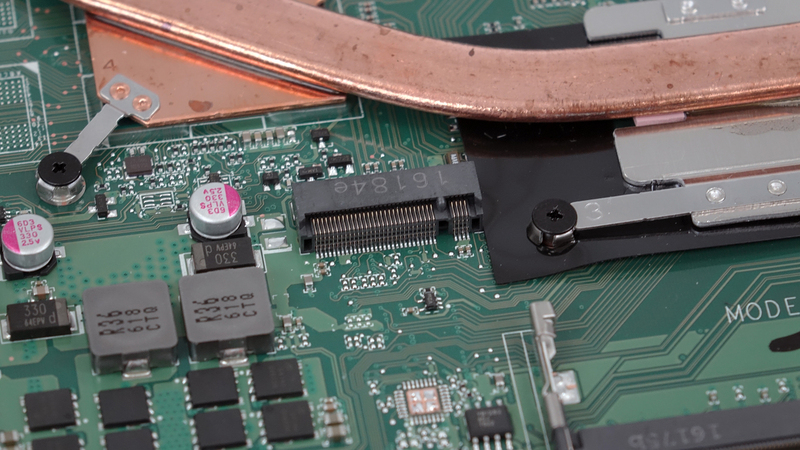 For more information, you can visit the full disassembly guide here. The display uses a budget Full HD (1920×1080) TN panel with matte finish manufactured by Innolux with model number N156HGE-EAB. Of course, the size of the screen is 15.6 inches delivering 142 ppi pixel density and 0.18 x 0.18 mm pixel pitch. It can be considered as “Retina” when viewed from a distance equal or greater than 60 cm. Viewing angles are poor due to the use of a TN panel. We’ve recorded a maximum brightness of just 209 cd/m2 in the center and the average across the surface is 194 cd/m2 with a maximum deviation of 16%. 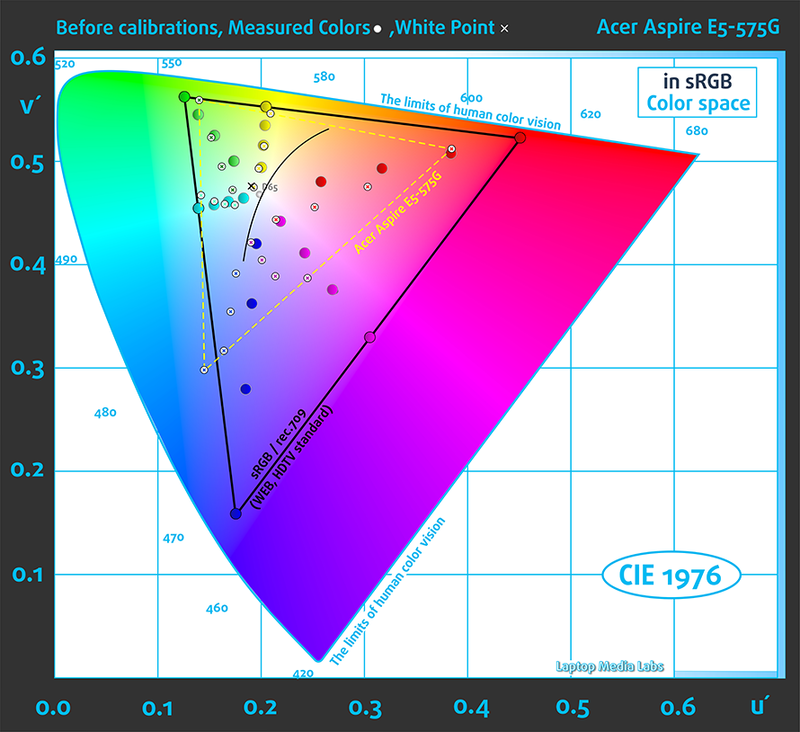 At least the color temperature is right on spot – 6530K and almost aligns with the optimal 6500K. The contrast ratio is low as well – 340:1. 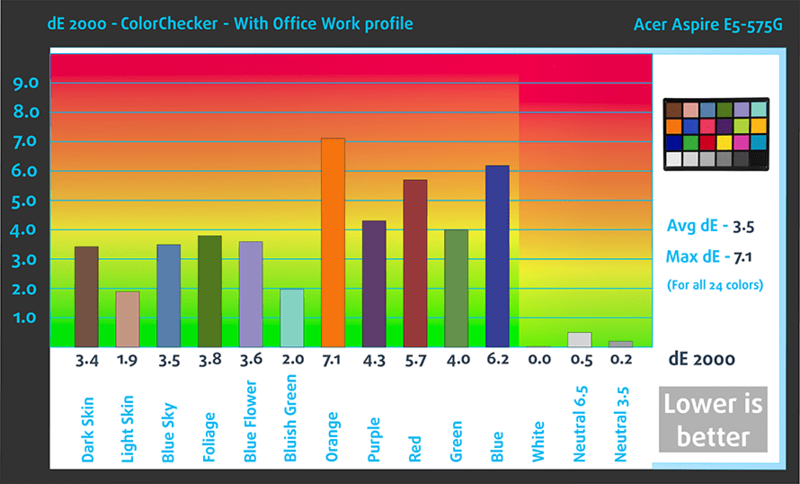 The maximum color deviation dE2000 is 3.9 which is not bad considering the fact that values above 4.0 are unwanted. To make sure we are on the same page, we would like to give you a little introduction of the sRGB color gamut and the Adobe RGB. Starting with the CIE 1976 Uniform Chromaticity Diagram that represents the visible specter of colors by the human eye giving you a better perception of the color gamut coverage and the color accuracy. Inside the black triangle, you will see the standard color gamut (sRGB) that has been used by millions of people in HDTV and on the web. As for the Adobe RGB, this is used by professional cameras, monitors and etc. for printing. Basically, colors inside the black triangle are used by everyone and this is the essential part of the color quality and color accuracy of a mainstream notebook. Still, we’ve included other color spaces like the famous DCI-P3 standard used by movie studios and the digital UHD Rec.2020 standard. Rec.2020, however, is still a thing of the future and it’s hard to be covered by today’s displays. We’ve also included the so-called Michael Pointer gamut, or Pointer’s gamut, which represents the colors that naturally occur around us every day. The display covers just 50% of the sRGB gamut so it’s suitable for general browsing and office work. Below you will see practically the same image but with color circles representing the reference colors and white circles being the result. You can see main and additional colors with 25%, 50%, 75% and 100% saturation inside the sRGB gamut before and after calibration. We’ve created the profile with the following settings: 140 cd/m2 brightness, 6500K color temperature, and sRGB gamma mode. Below you can see the results from the accuracy color checker with 24 commonly used colors like light and dark human skin, blue sky, green grass, orange etc. 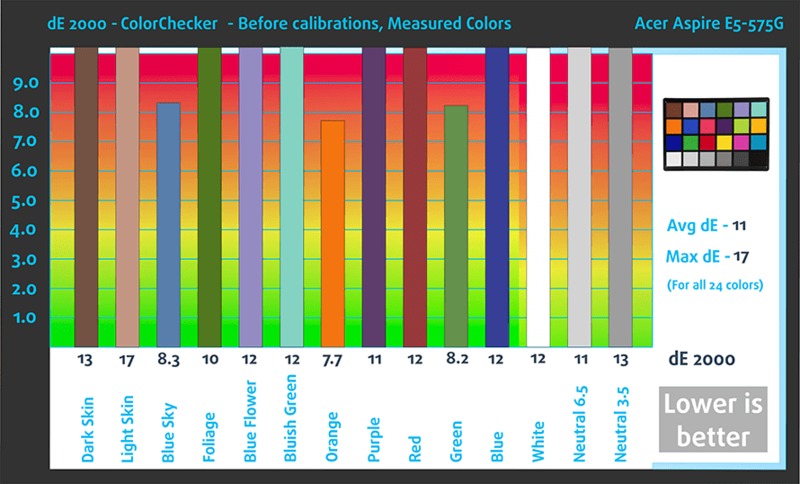 The results are before and after calibration and as you can see, after calibration the screen has excellent color reproduction. We’ve also measured how well the display is able to reproduce really dark parts of an image. It’s essential when watching movies or playing games. The left side of the image represents the display with stock settings while the right one with our custom profile for gaming and multimedia. On the horizontal axis, you will find the grayscale and on the vertical axis the luminance of the display. The display offers good visibility in dark areas of an image but it’s further improved by installing our profile. We illustrate the first five levels of the gray (1%-5% white), right after black level, using the five boxes on the image below. Keep in mind that whether you can distinguish them or not strongly depends on the settings of your current display, the calibration, the viewing angle and the surrounding light conditions. We recorded Fall Time + Rise Time = 11.7 ms.
No PWM was recorded above 17% brightness, which is around 55% cd/m2 and it’s way below the needed luminance for comfortable working or watching a movie, for example. We consider the screen user-friendly and even users with sensitive eyes shouldn’t feel the strain. With our Health-Guard profile installed, you can benefit from reduced blue light emissions. You can see the levels of emitted blue light on the spectral power distribution (SDP). As we expected, the notebook features a budget TN panel, which lacks some important properties for good multimedia experience (low brightness, narrow sRGB coverage, low contrast) but it’s quite normal for this price range. At least you get 1080p resolution on a flicker-free display, which is more than you could ask at this price. However, by using our profiles, you will benefit from greatly improved color accuracy, better visibility in the darker areas of an image and lower blue light emissions. We are generally happy with the sound quality and no major distortions were detected. 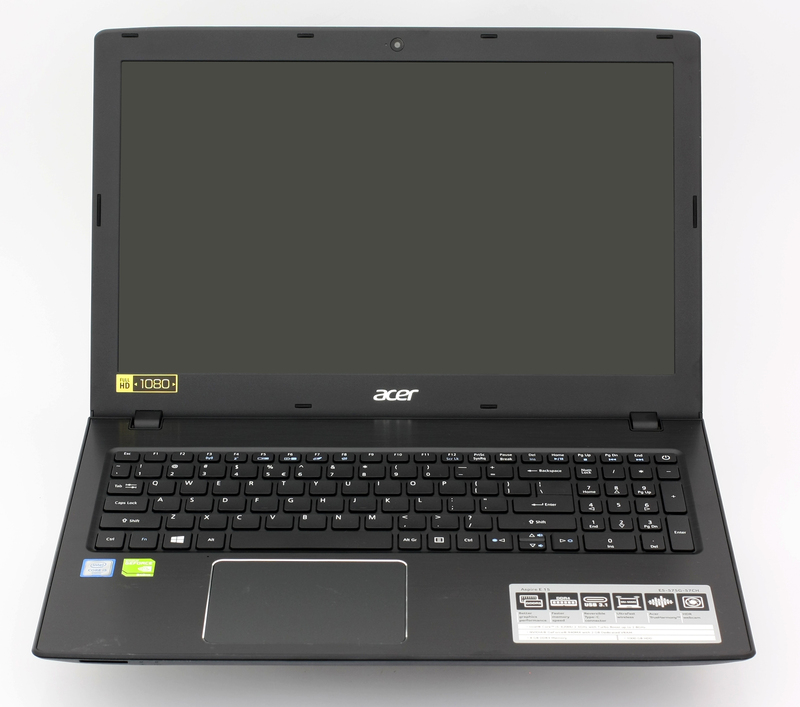 We used a freshly installed Windows 10 (64-bit) for the testing of this unit and if you wish to perform a clean install of the OS yourself, we suggest downloading all the needed drivers from Acer’s official support page. The notebook’s battery, which is rated at 44Wh, scored average runtimes in our battery tests. It’s quite understandable that the notebook’s battery life can’t be compared to most mid-range devices out there. Anyway, all tests were performed using the same settings as always – Wi-Fi turned on, Windows battery saving feature switched on and screen brightness set to 120 cd/m2. An average score on the web browsing test – 303 minutes (5 hours and 3 minutes). Slightly lower scored and even falls slightly below average – 273 minutes (4 hours and 33 minutes). We recently started using the built-in F1 2015 benchmark on loop for accurate real-life gaming representation. It’s quite unlikely that you will start a gaming session without being close to a power source, but it’s good to know that you can play for about hour and a half – 93 minutes (1 hour and 33 minutes). ntel Core i5-6200U is a 6th generation dual-core CPU. It is manufactured using 14 nm FinFET process, meaning it’s part of the Ultra-Low Voltage lineup.The CPU is clocked at 2.3GHz, but thanks to the Turbo Boost technology it could automatically increase its clock speeds up to 2.8GHz for a single core and 2.7GHz when two cores are functioning. It is designed using Intel’s Skylake architecture allowing it to have similar performance to Intel Core i7-5500U, which is part of the Broadwell lineup. The CPU boasts four logical cores and 3MB level 3 cache. It consumes 15W of energy and can operate at a maximum temperature of 100 degrees Celsius. The SoC also integrates Intel HD Graphics 520. Its performance is similar to that of NVIDIA’s GeForce GT 820 GPU. The GPU can be clocked at up to 1000MHz. The SoC supports the Dual-Channel DDR3L-1600/DDR4-2133 Memory Controller, HyperThreading, AVX, AVX2, Quick Sync, Virtualization and AES-NI technologies. Here you can see an approximate comparison between the CPUs that can be found in the Acer Aspire E 15 (E5-575G) models on the market. 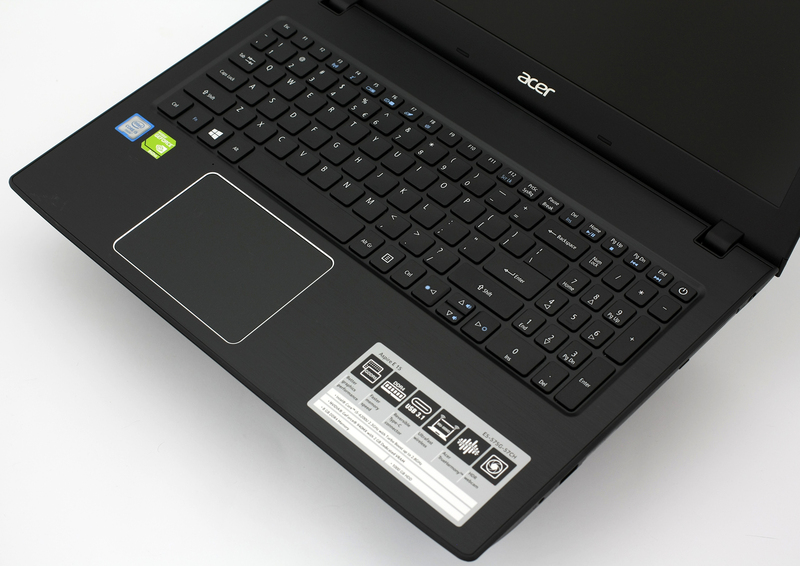 This way you can decide for yourself which Acer Aspire E 15 (E5-575G) model is the best bang for your buck. Fritz is a chess benchmark that tests the computing capabilities of the CPU with various chess moves. The Intel Core i5-6200U managed 5.534 million moves per second. By comparison, one of the most powerful PCs, Deep(er) Blue, was able to squeeze out 200 million moves per second. In 1997 Deep(er) Blue even beat the famous Garry Kasparov with 3.5 to 2.5. The NVIDIA GeForce 940MX is a refreshed version of the older 940M mobile chip but paired with a faster GDDR5 memory and slightly higher clock speeds, which result in noticeably better performance compared to the standard 940M. However, some OEMs will still choose to use the cheaper DDR3 version of the GPU. Announced back in the first quarter of 2016, the chip is almost identical to the standard 940M (Maxwell) but with clock speeds increased up to 1242 MHz and base 1122 MHz. Again, the memory uses a 64-bit bus and has 2GB of GDDR5 VRAM. It still supports the DirectX 12 API and Shader 5.0 feature along with the usual NVIDIA technologies – CUDA, GPU Boost 2.0, Optimus, GeForce Experience, PhysX. 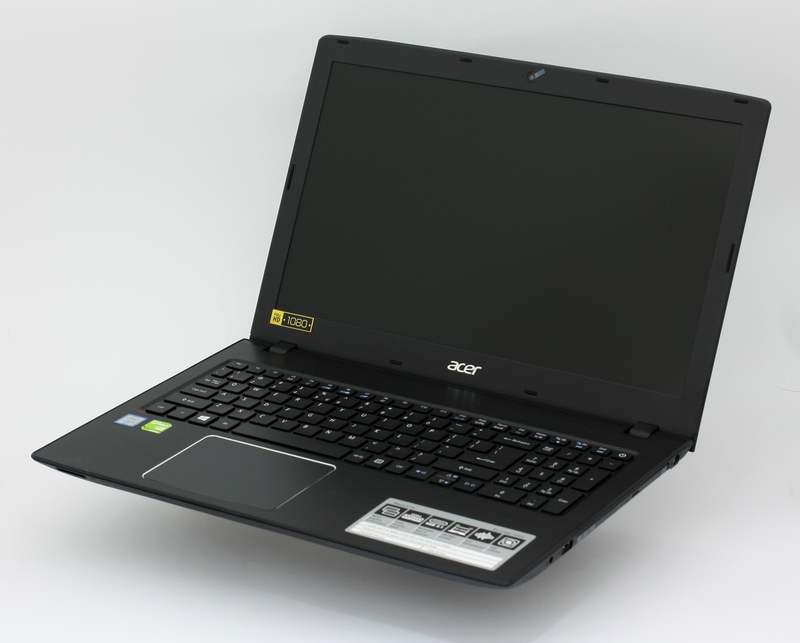 The whole GPU is rated at around 15 to 30 Watts depending on the clock speeds and memory used in the specific notebook. Here you can see an approximate comparison between the GPUs that can be found in the Acer Aspire E 15 (E5-575G) models on the market. 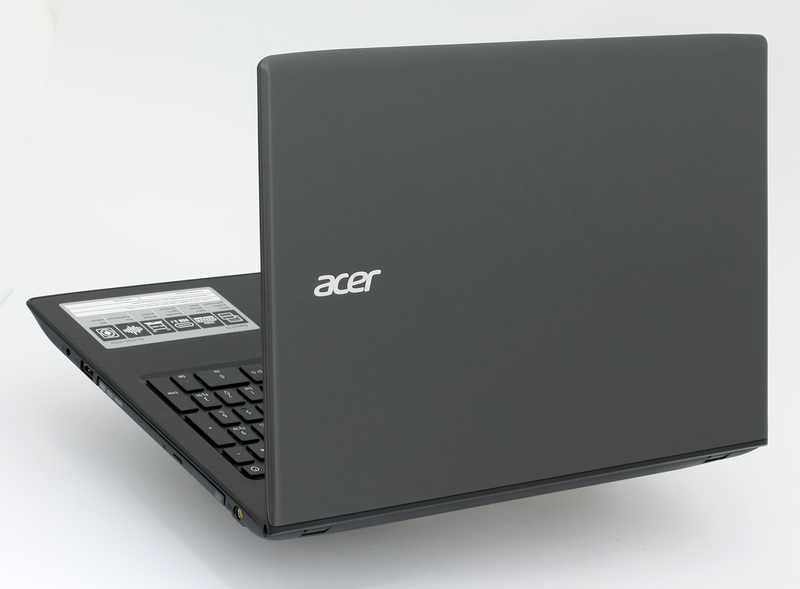 This way you can decide for yourself which Acer Aspire E 15 (E5-575G) model is the best bang for your buck. This test doesn’t really represent real-life use since the general user won’t be able to fully load the CPU and GPU at the same time for such long periods of time. However, it’s a good way to determine the overall system stability and cooling design in the long run. We started with 100% CPU load for an hour, which lead to 71 °C silicon temperature and clock speeds declining from 2.8 to 2.7 GHz, which is basically the maximum Turbo Boost frequency for a Core i5-6200U with two active cores. You can see the temperature and load on the graph below. After and hour had passed, we turned on the GPU stress test as well. 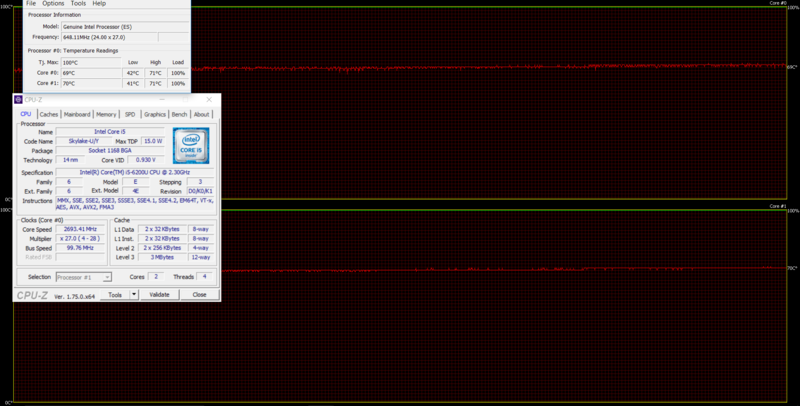 That’s when we found out that the GPU actually is clocked at 861 MHz maximum frequency and just 795 MHz as base one. Probably Acer has limited the clock speeds, although NVIDIA lists at least 1242 MHz maximum clock speeds. 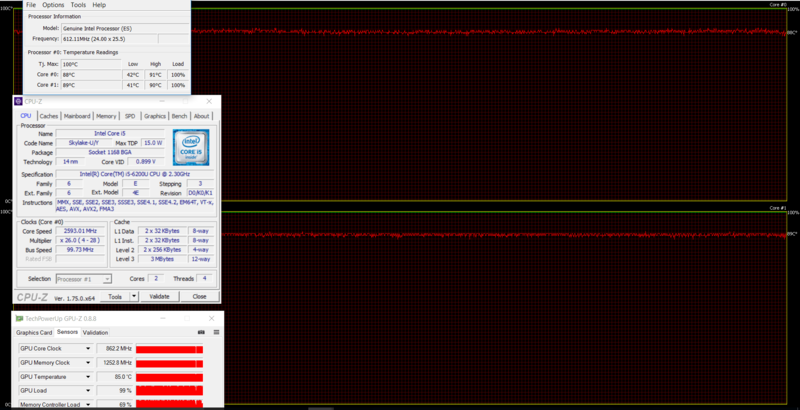 However, we can easily see why Acer has limited the clock speeds. It’s because the cooling system kept the GPU at 85 °C and the CPU at 90 °C. That’s a lot more than we expected from a notebook with mid-range GPU and ultra-low voltage processor. The relatively high heat resulted in pretty warm surface around the keyboard and touchpad. The left side of the wrist rest area along with the center of the keyboard and touchpad reached high temperatures – nearly 45 °C. While this is normal for a fully loaded laptop, it’s not a usual outcome for a lower-end hardware to generate so much heat. It poses a serious question regarding the overall stability of the system in the long run. As we all know, the older the notebook gets, it tends to keep higher temperatures when taking care of CPU and GPU intensive tasks. During normal working sessions, though, the system will do just fine. Acer’s Aspire E15 (E5-575G) is an amazing all-rounder with few drawbacks – taking into account the price point, of course – because it delivers unmatched performance, decent and refreshing design and features usually found on a mid-range laptop. We’ve got a GDDR5-powered GeForce 940MX GPU suitable for light gaming, Core i5-6200U ultra-low voltage, yet powerful CPU, two DDR4-2133 compatible RAM slots, M.2 SATA SSD slot, which we tried and works with a 2280 standard stick, USB-C 3.1 for ultra-fast data transfer and perfectly good keyboard and touchpad. And all of this for just $550 as a starting price. What’s not to like, right? Well, there are a few drawbacks to consider here. The image quality isn’t the best but that’s normal for an entry-level notebook. However, the maximum brightness can be considered as lower than we are used to seeing but at least the panel doesn’t use PWM from 17% brightness and above. This is pretty important for users with sensitive eyes. We also suggest pairing the display with our Health-Guard profile to also limit the negative blue light emissions as well. And last, but not least, we have to address the cooling solution. While it might not pose a problem for most users because it’s not a laptop intended for continuous high load, some like to play a few games every now and then. If you are planning to use it for light gaming, you also have to consider the heat generated from the CPU and GPU dispersing around the center of the keyboard and around the wrist rest area. It gets a bit warm. Good review, going to buy this because of no screen flickering. Where’d you get one that included a cd/dvd drive and cd with drivers? Lol mine came with a placeholder piece of plastic instead of an optical drive, although it does have the pins if you wanted to install your own. Since it’s an M key M.2 slot, does it also support an NVMe PCIe slot, like an Intel 600p uses? We’ve tested our model and it didn’t support PCIe NVMe at the time so we cannot confirm this. Wow this review is so in depth, is great. And this laptop as well, I have the 575G-5KK, the only thing it lacks is the DVD burner and it has the 940MX with 512 cores but 860 MHz. It’s true that it gets pretty hot after playing for a while but the VGA port is worth it, I can plug an old monitor I have here laying around and make some 3D modelling. I own this kind of laptop, but i can’t scroll with touch pad. Any one can help me to solve this problem please ? I already bought this model, but thre is a big mattr, its so heating when i playing the games,( its ike a electric iron) , is it normly or abnormaly, plz help me? i have acer aspire 15 e5-575g-728J, how can i turn on the backlit ? Hi, what kind of PCI works this M2 Slot ? Can i use both SSD and HDD at the same time ? Hi, can u suggest which SSD M.2 brand would be the best and compatible for Acer E 15 E5-575G-51KQ ( stated as above model, I guess ) ? ?